Local community leaders first began organizing for this ordinance in 1994. The Wilkes-Barre City Council voted down the ordinance in a 1-6 vote. 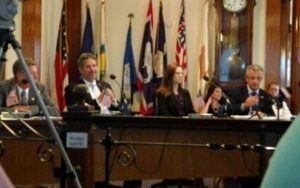 Newly-elected City Council members Beth Gilbert and Tony Brooks supported the introduction and passage of the ordinance in 2016. Council member Gilbert introduced the ordinance on August 11, 2016. At a work session before its introduction on August 9, 2016, Council member Brooks shared his coming out story. The ordinance was unanimously approved, 5-0, at its first consideration on August 11, 2016. The ordinance was unanimously adopted by the council in a 5-0 vote on September 15, 2016.